Yesterday's visit to Snug Harbor Farm in Kennebunk, Maine reminded how inspired I have been by Tony Elliot's operation there since discovering it 13 years ago. Everything he creates on this gorgeous property is done with big vision, passion and energy. From greenhouses filled with rare and unusual plants, to exotic birds and animals, to the intimate garden rooms created by espaliered fruit trees, this extraordinary nursery is a sanctuary from the rest of the world for the beginning gardener to the expert. When Tony gets interested in a species, the hunt begins for the rarest and finest forms. Here is a collection of succulents, rare to find in Maine. 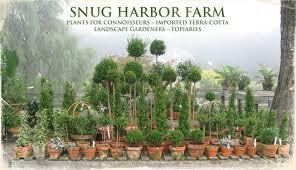 But if you want Topiary...this is the place to go. Many of his greenhouses are dedicated to growing all types of topiaried plants; myrtle, lavender, curry. If you can grow it, he can train it! But I was on the hunt for rare begonias...of which he has many. His collection has been featured in Garden Design Magazine, and here is one his blog entries on the subject of begonias. I picked up a few for my own collection...a Ginni and a Deco Chicks. Be sure to stop by Snug Harbor Farm when in lower Kennebunkwhen you have some time because you will be well rewarded and inspired!